It's been a few years since we've dined at Wildflower so it was more than overdue for a re-visit. Unfortunately every time we called it was booked. Eventually our luck had to change and so it did and happily we scampered off for a spur of the moment, leisurely Saturday lunch. 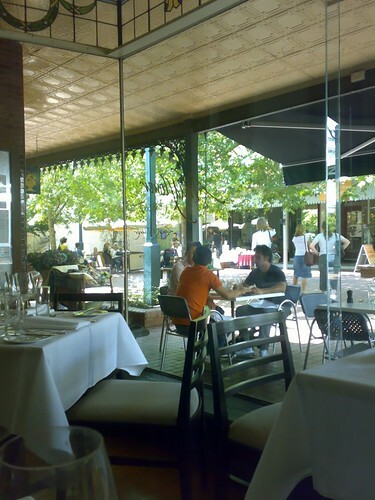 Wildflower is located in a traditional Victorian building - lace trimmed veranda on a pedestrian only lane. 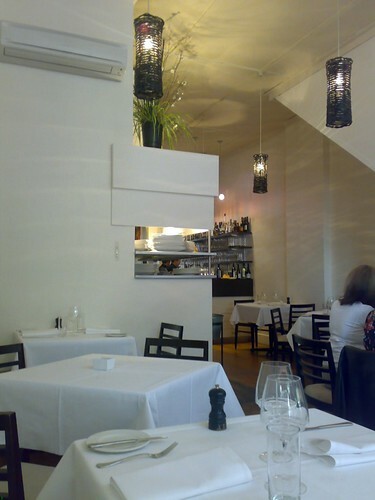 The interior is light and airy and lacking any of the stuffiness that the exterior might imply. 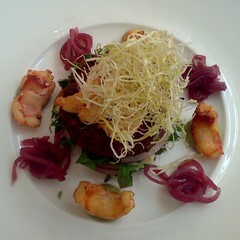 For Saturday lunch there are two menus, a fixed price and a la carte. We opt for the a la carte. I've never had hermit crab before but it was delicious with its quasi prawn/crayfish characteristics. A large cube of falafel sat underneath the deep fried finely shredded leek along with more hermit crab pieces. A generous serving indeed. 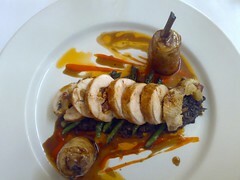 My main: Chicken ballotine with porcini mushroom filling on a bed of green beans. I'd call this quite a large serve but it was delicious. 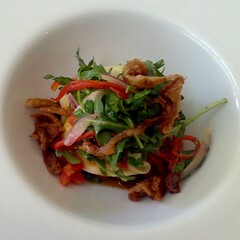 Earthy flavours from the porcini mixed with succulent chicken. 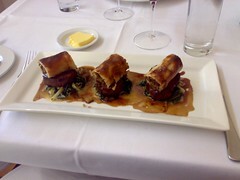 Paalo's main: Venison medallions topped with strudel. Another generous portion of 3 meltingly soft medallions of venison. A sticky rich jus coats the plate. 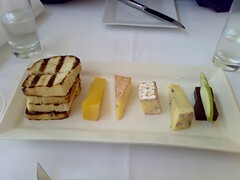 Cheese course - tasmanian gruyere, shadows of blue, comte and a camembert served with thick slices of char-grilled bread. 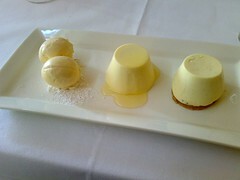 Desserts - they do things a little differently here. The dessert menu consists of 19 items of which you can pick any 3 to make up your dessert plate. This is Paalo's - the centre item is a Kaffir Lime Panna Cotta which was incredible - next time Paalo might just order three of them! We certainly won't be waiting too long before we return. looks a really ponsified place to me. the sort of place that leaves you so hungry that you have to nip into the kebab shop after. the bill, however, is another story - your credit card has dried up that you cannot pay your rent and council tax so you're left begging in the streets with a placard round your neck stating "ate in an expensive restaurant, skint, any spare change will do. Well Hector perhaps next time rather than just stand on your soapbox you might actually take the time to read the post you are commenting on - then perhaps your comments won't be so laughable.